Bowel regularity is more of an individual experience than a collective one. One person might get rid of solid waste once or twice a day, while another might have the urge to eliminate just once every couple of days. Constipation – or the inability to easily and frequently pass stools – is the number-one digestive complaint in the United States, according to UCSF Medical Center. Eating high-fiber foods like raisin bran can help trigger some intestinal action. As with any processed food, the amount of fiber you’ll get from a serving of raisin bran cereal depends on how the product was made. 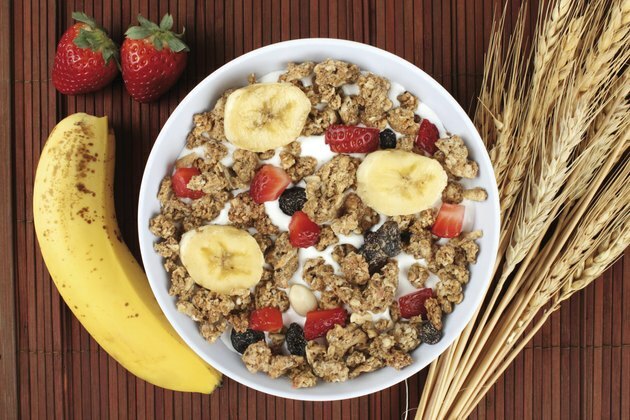 Cereals made mostly with whole-grain wheat and wheat bran are usually higher in fiber than those that also include refined wheat flour or other types of whole grains. A 1-cup serving of raisin bran generally provides close to 200 calories and 7 to 8 grams of fiber, or right around 30 percent of the recommended daily value. One major brand of raisin bran has just 4 grams of fiber per cup, largely because it contains corn bran rather than wheat bran. To relieve constipation, choose a product that delivers at least 5 grams of fiber per serving. More than 80 percent of the fiber in raisin bran is insoluble, according to the Harvard University Health Services. This is because wheat bran is one of the best sources of insoluble fiber available – of the 12 grams of fiber in a 1/2 cup of pure wheat bran, 11 grams come from insoluble fiber. This type of fiber is sometimes referred to as “roughage” or “bulk” because it takes on water as it moves through your digestive tract and sweeps waste material through your intestines more efficiently. It also helps your body produce larger, softer stools that are easier to eliminate. Although most of the fiber in a bowl of raisin bran comes from the bran flakes, raisins are also a good source. Eating raisin bran may be an effective, convenient way to get your bowels moving, but it’s not necessarily your healthiest option. Cereals are a major source of sugar in the American diet, and it’s not unusual to get somewhere in the neighborhood of 20 grams of sugar from a serving of raisin bran. To put that amount into perspective – the Harvard School of Public Health recommends avoiding any cereal that contains more than 5 grams of sugar per serving. Raisins are responsible for some of the sugar in raisin bran cereal, but nutrition labels don’t differentiate between added sugars – the kind used to sweeten bran flakes – and natural sugars, like the kind in raisins. When it comes to sugar, you may be better off buying a low-sugar, high-fiber bran cereal and topping it with 2 tablespoons of raisins. Bowel regularity is mostly determined by your overall health, level of physical activity and diet. Getting enough fiber is a key recommendation for both the treatment and prevention of constipation. Dietary guidelines suggest that men and women through the age of 50 need about 38 grams and 25 grams of fiber a day, respectively, while older adults require slightly less. Whole-grain products are generally rich sources of insoluble fiber, as are dried beans, peas and lentils. You should also drink plenty of fluids – not only does fiber require water to work, but a 2013 study published in the ''American Journal of Gastroenterology'' suggests that people who get enough fluids are less likely to be constipated, irrespective of how much fiber they consume.